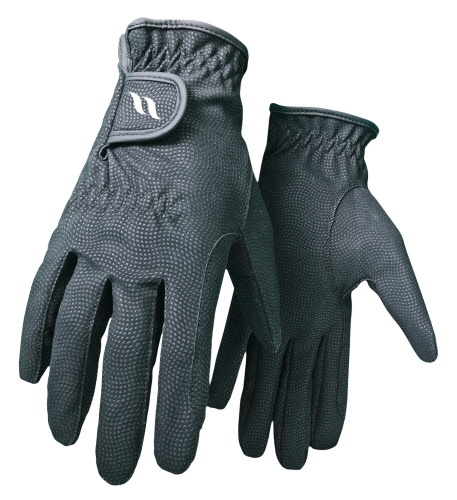 Now Back on Track gloves to wear while riding your horse or just outdoors to keep your hands warm.. If you suffer from arthritis pain in your hands or poor circulation in your fingers, try these Gloves. Designed to work with your natural body warmth and gentle heat. Our gloves accomplish this with the state-of-the art, ceramic-infused Welltex fabric that contains ceramic powder melted into the fabric’s thread. The ceramic powder reflects your own body warmth and creates a soothing far infrared thermal warmth. Thermal heat is a well-recognized method used for improving blood flow and relieving pain. For arthritis pain, wear the gloves as is. Sizes: Measure length from middle finger to bottom of hand/top of wrist. Tend to run small, so we suggest you order up a size from what you would normally wear.